Ask around most family biking circles in Vancouver who they should talk to for advice on riding with kids, and you’ll almost certainly be pointed in the direction of Lisa Corriveau, also known as Spokesmama. 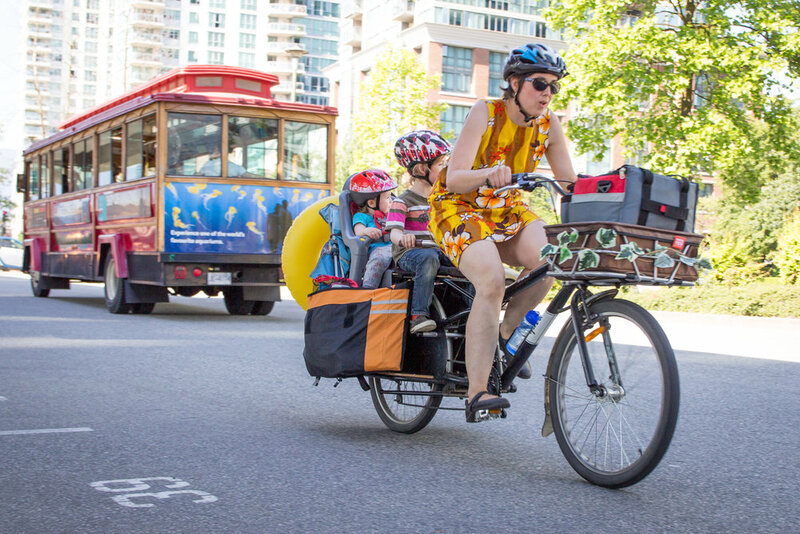 A fervent advocate in Metro Vancouver, Corriveau has built a name for herself as the person “in the know” when it comes to all things family cycling, but like most local “bike celebrities”, her entry into activism was not a clear path from the start. With an educational background in Visual and Language Arts, Corriveau has enjoyed a career as a freelance writer since 2010, when she first started her blog The Sprog (named after the nickname for her then-unborn first child), and has since contributed to several organizations and publications. She used her blog as a platform to share stories of her life as a mom in Vancouver, including cycling, DIY projects, sustainable living, and how she made life without car ownership work for her family. “There’s one thing that really scares people about car share,” says Corriveau, “And that’s figuring out what to do with the children and their car seats, but it hasn’t been that complicated, really.” She is proud of the fact that her children have grown up experiencing driving as an occasion instead of an expectation. But she also recognizes her role in helping others realizing the possibility of being a biking family. In June 2015, together with friend Tonya Louie and help from a neighbourhood grant, Corriveau organized the first Mount Pleasant Family Biking Festival, bringing together the local bike community to share their experiences biking with kids, show off their various rigs, and of course, some fun activities for the kids. Being able to teach people about cycling sparked a passion in Corriveau that, in 2016, brought her to becoming a certified bike educator for local advocacy organization, HUB, with the particular privilege of passing on her knowledge to the next generation of bike riders. “I was looking for work again because my kids were getting older and it just seemed like it would be a lot of fun!” she reveals. Largely teaching in elementary schools, she spends two days with students ranging from grades three to seven, teaching them the theoretical knowledge about bike components, maintenance and safety on the first day, and then taking them out on their bikes to practice the practical skills in a makeshift course on their school grounds. The position takes her to schools all over the Lower Mainland, including an exciting journey to Bowen Island. “My commute was getting up before dawn, taking my Brompton downtown, catching the water taxi to Bowen, and then riding the ferry home. The second day we brought a truck full of bikes and spent several hours at a park a couple blocks away from the school with views of the water and forest around us. That was a particularly hard day at work,” she muses sarcastically. 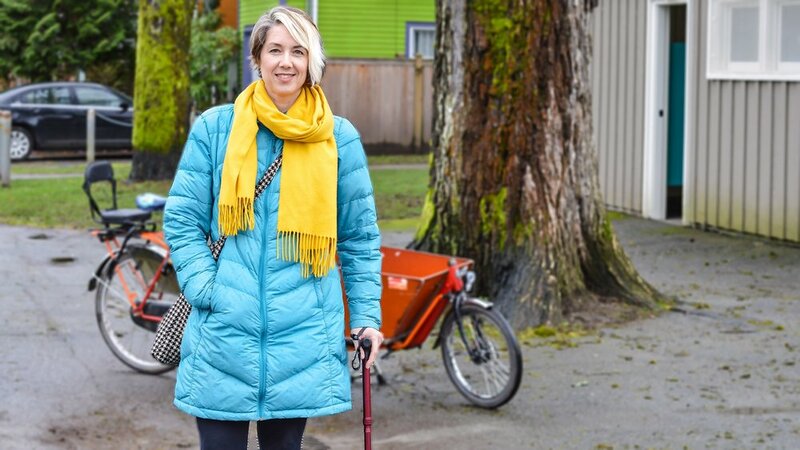 “I think a story that gets ignored a lot is people who bike because they have mobility issues,” she reveals. “Biking is better for me and a lot of other people out there.” Corriveau points out that usually when we see people on bikes, we assume they are physically fit and capable and not that the bike is their mobility device. “There are a lot of issues that go with it.” She refers to how something as simple as bike rack placement and design can create massive challenges for people with mobility issues, namely that they are often design for “standard” bikes – road or hybrid bikes, and not trikes, cargo bikes, and adaptive bikes. Even the width of certain cycle tracks can become a challenge, especially in areas when bollards and dividers make the path even more narrow. But Corriveau isn’t hiding behind her keyboard, participating as an active member of the City of Vancouver Active Transportation Policy Council, a group of local leaders who regularly meet with members of council and the City’s planners and engineers to discuss proposed infrastructure, policies and plans. “I find it really interesting to get to see what’s going on in the city and have the opportunity to provide feedback and be consulted as an expert with fourteen other people.” As volunteers, the group brings their personal knowledge and experience to the table, providing their insights based on what it is actually like for them travelling through the city. For Corriveau, this includes highlighting her challenges cycling in Vancouver as both a mother and someone living with arthritis. This story was written by Melissa as part of her ongoing “Women in Urbanism” series; designed to shine a light on the dedicated and talented women shaping cities for the better. Do you know of someone who deserves to be profiled in a future segment? Please send them our way.